By Daniel Horowitz--PJ Library (PJ as in pyjamas), which offers free, high-quality Jewish books and music each month to families raising Jewish children, achieved a major milestone recently when PJ’s 82 year-old founder Harold Grinspoon hand-delivered the organization’s 3 millionth Jewish children’s book to a Livingston, New Jersey family. The program now sends 100,000 free books to families across North America each month – up from 200 a month in 2005, when Grinspoon first started the program in Massachusetts. One of PJ Library’s goals is that somewhere between Dr. Seuss and the Berenstein Bears, a child may turn to a book like Vivian Newman’s “Ella’s’ Trip to Israel” or Toronto’s own Aubrey Davis’ “Bagels from Benny” and spark a Jewish discussion in a household that doesn’t have enough of them. The program’s impact is felt throughout Jewish federations, community centres, synagogues, and other organizations that partner with PJ Library in making these books available to young children and their families. For almost two years, UJA Federation of Greater Toronto’s support of PJ Library has helped bring the books to over 1,800 families in York Region, one of the fastest growing Jewish communities in the world. While The Harold Grinspoon Foundation funds about 50 percent of the program, locally the program is made possible by the generous donations of Gabi Weisfeld, the Weinbaum Family Foundation, Phyllis & Ab Flatt and UJA Federation. The books, which are chosen by a selection committee of educators and editors, run the gamut from explicitly Jewish to barely so. The themes reflect the personal dedication of the program's founder, who puts a premium on stories promoting tikkun olam (repairing the world), Jewish summer camp, visiting Israel and contemporary families enjoying Judaism. Each age group, from 6 months to 5 1/2 years old, receives its own age-appropriate books, and all the books include a parents' guide for further discussion or activity. Currently in over 170 communities in Canada, the United States, Israel and Australia, UJA Federation is seeking additional funds to expand PJ Library across the Greater Toronto Area. 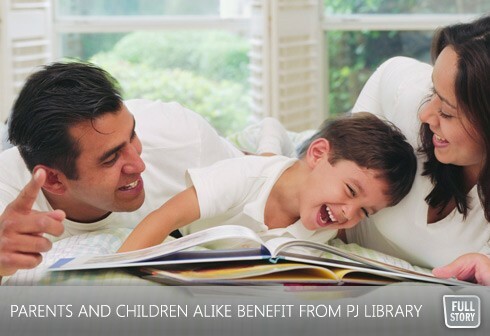 For more information about PJ Library, or to enroll, please visit pjlibrary905.ca.